It’s hard to claim that we want to escape the winter cold when we live in southern California, yet the warmth and sunshine of Playa del Carmen beckoned us in mid-January. This year, we managed to avoid a week of California rain. 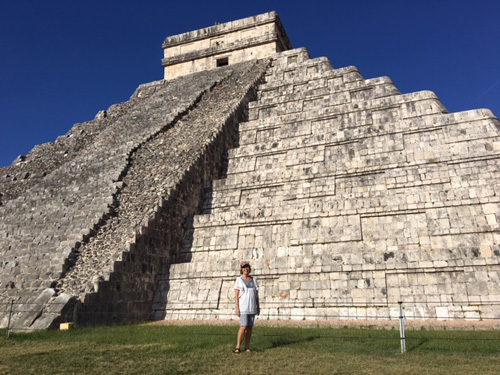 Instead, we lounged in the beauty of the Yucatan Peninsula, immersed ourselves in plenty of history and culture, and returned home to green hills that had been beautifully cleansed while we were away. 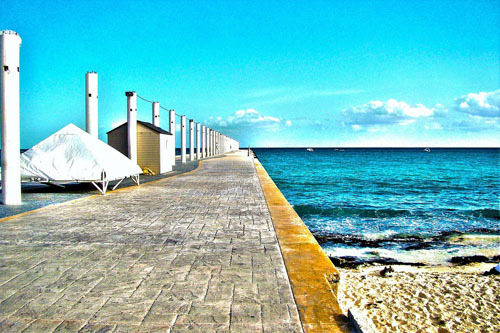 The area of Playa del Carmen has something for everyone. Huge resorts dot the beaches, but smaller inns and Airbnb are also readily available. We exchanged a timeshare to stay a week at Mayan Palace at Vidanta Riviera Maya. This complex is home to Cirque du Soleil, a championship golf course, crocodile pond, half a dozen swimming pools, and more restaurants than we could count. They also offer recreational activities, such as Zumba and Spanish classes, to begin one’s day. It took a couple of days to learn the ropes of maneuvering ourselves around the massive complex. But soon the golf carts and shuttle busses became second nature, and strolling down to the pool, snack bar, and beach only took a few minutes. We liked that Vidanta was not an all-inclusive since we chose to be gone from the resort most days. On the other hand, many resorts in the Cancun area are all-inclusive. A quick search on bookit.com brings up dozens of choices. Specials run non-stop, making the choosing of the resort almost as much fun as the trip itself. Ones that especially cater to families are Occidental at Xcaret, Hotel Xcaret, and El Cid at Puerto Morelos. Parents can drop their youngsters off at the Kids Clubs and try their best to pull them away from the non-stop activities at the end of the day. Many other resorts are geared solely to adults with luxurious ambience over-flowing at every turn, such as Catalonia Royal in Tulum. No matter the choice, we discovered that the hospitality of the employees was superb. They have hospitality down to a science, always radiating gracious smiles and Latin warmth. For those who want to stay at a smaller accommodation, there are plenty of Airbnb offerings. A friend of mine just returned from a Four Girls’ Outing to Tulum, renting a home on the local beach that hugs the ancient ruin. They loved the simplicity, the independence, the use of a rental car on excellent roads, and delicious meals that averaged less than $2. We began our week with a food tour that began and ended in the downtown area of Playa del Carmen. Xantal of Cozumel Chef’s Food Tour guided us in our ample samplings of varied flavors, vibrant colors and variety of spices and ingredients. We began with a local street vendor in the park, falling in love with his baby suckling pig that is slow roasted in the earth, wrapped in a banana leaf, and marinated with bitter orange and annatto. Then we taxied away from the center of town to sample quesadillas loaded with Oaxacan cheese and fillings of our individual choices. Anyone serious about learning about Mexican food enjoys a trip to the market to learn about fruits, vegetables, dried chiles and spices. Mexican stew hits the spot as we slurp away, followed by carnitas (translated to mean “little meats.”) We taxi back to town to choose ice cream, my flavor being pineapple sprinkled with chile. Yum! (Additional information can be located at www.cozumelchef.com). After the tour, the afternoon was ours to explore the beach and the shopping area of Playa del Carmen, especially loving the jewelry shops and their local stones. Every so often one has the opportunity to tour with an exceptional organization. Enough cannot be said about Altournative. Altournative is a Mexican company that began in 1998 when its owners left Mexico City and committed themselves to adventure and cultural tourism in the Caribbean. 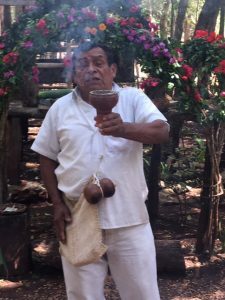 Passionately, their guides share the essential and genuine Mexico by sustaining authentic Mayan villages and eco-tourism. They cater to relatively small groups, ours having ten people the first day to Coba, Tulum, a Mayan village complete with Shaman ceremony, and a cenote plunge. 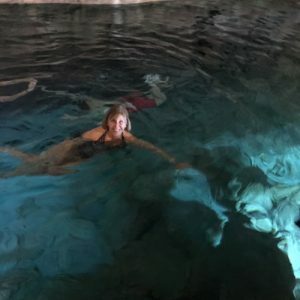 For our second day we joined one other traveler to drive to Chichen Itza, a Mayan village and ceremony, and a swim in Cenote Mayan. Alex, our guide the first day, was a wealth of knowledge about the ancient ruins of Coba and Tulum. And Paco, our guide to Chichen Itza, could readily field any question about the inhabitants who once lived there. But, even more remarkable, was their empathetic manner with the people at the villages that Altournative supports. 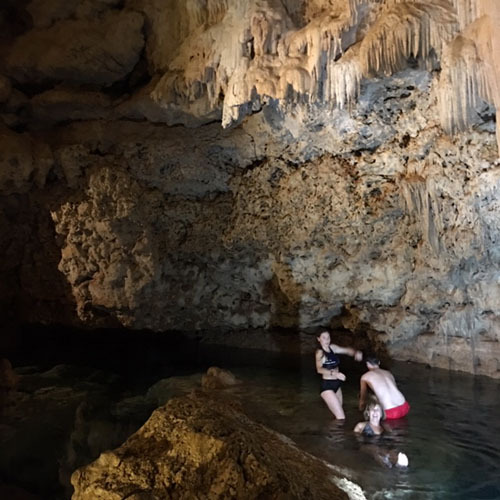 The Mayan descendants prepared delicious lunches, welcomed us with a Shaman blessing, and showed us the ropes of swimming in the cenotes (underground caves.) We readily felt as if we were family, a true treasure that ever so often becomes a gift when one travels. (More information can be found at https://altournative.com). Xcaret is the equivalent of Disneyland to the Yucatan Peninsula. It is an eco-archaeological park where one finds over thirty activities to enjoy, from water adventures to cultural experiences on firm ground. The cenote in Xcaret is immense. Life jackets and inner tubes make a snap out of spending about ninety minutes wandering down the cave’s channel. Exotic birds, horse shows, aquariums, dolphin arenas, butterfly havens, and chocolate making demonstrations compete with local artisans to please the fussiest of visitors. And the show in the evening is spectacular, giving a taste of Mayan history and Spanish conquest with a dousing of splendor of costume and song. Definitely, plan on spending a full day at this resort. On our final afternoon we went out of Puerto Morelos on a catamaran to snorkel. The reef from here is the second largest coral reef in the world, extending down to Belize. I marveled at a barracuda, a few sting rays, bright blue-yellow fellows, and entanglement of plants of just about every kind. Again, the hospitality of the crew was astounding. Jokes ran as freely as the drinks, and the crew could not do enough to please everyone’s wish. It seemed like second-nature to give fantastic customer service, a souvenir that long remains with any visitor. Indeed, the week was busy and varied. Most of all, I was amazed at how very much there was to do. 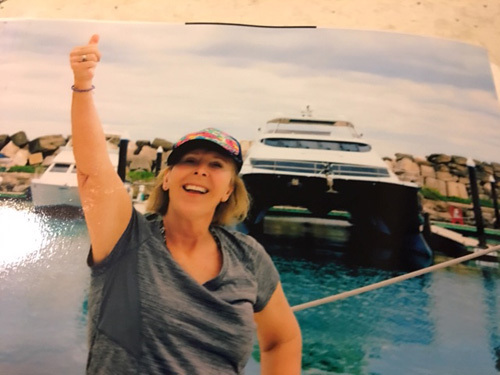 I might opt to go back and relax more by staying at an all-inclusive resort and having my daily activity be rolling out of the hammock to swim a lap or two or plunge in the ocean. Then again, I might readily agree to striking out on my own with an Airbnb home rather than living the lavish resort-style. But, I surely cannot fault what we did and the groups we joined for our activities. I often heard “Muchas gracias a mi Corazon” (Thank you very much from my heart,) and it’s hard to beat that kind of memory no matter where one travels or what style one wishes to sample.